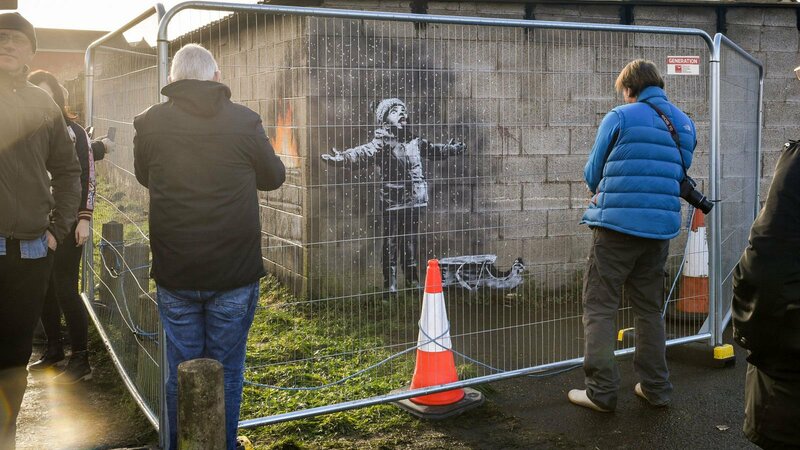 A Banksy mural painted on the side of a garage in the Welsh steel town, Port Talbot in Taibach is being protected by Generation Hire & Sale heavy duty round top fencing. The fencing was put in place by the local council to ensure the Banksy artwork was not damaged. The Banksy Mural appeared overnight just before Christmas and has attracted approximately 2,000 people travelling from as far as Australia to catch a glimpse! It was clear the Mural would need protection from the thousands of visitors it was generating. The Generation Heavy Duty Round Top Anti-Climb Fencing was the clear choice for protecting the Banksy creation as it uses Smartweld technology and corner webs for increased strength and longevity. From one angle, it shows a child in a bobble hat with a sled, apparently enjoying a snow shower and trying to catch the flakes on their tongue. But from another, it becomes clear that what is actually falling on the child is a shower of ash. The Banksy creation has been sold privately for a “six-figure sum”. Banksy revealed he was the artist behind the mural in an Instagram video entitled Season’s Greetings. For more information on Generation Hire & Sale Fencing please contact your local branch.